1. Preheat oven to 350F. Place chicken on baking sheet seasoned with black pepper, and cook for 30-40 minutes or until internal temperature is 165F. Once cooked, allow to cool, and dice into ½” pieces. 2. Pour olive oil into large skillet and heat over medium-high heat. Add diced onions, allow to cook for 2-3 minutes before adding cabbage and mushrooms. Cook until almost tender, then add diced tomatoes. Cook for one more minute, tomatoes should start to soften. Remove and strain juices. 3. Spray a clean skillet with cooking spray, heat over medium heat, and add whole wheat tortilla flat in the skillet. 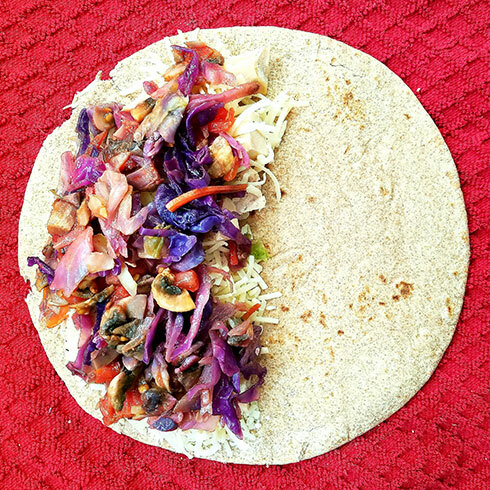 Layer 3-4oz of cooked chicken, ¼-1/3 cup of shredded cheese, and ½-1 cup of cooked veggies on half the tortilla (see picture). Fold the empty half onto the toppings to create the quesadilla. Cook for approximately 3-4 minutes on each side. Use a large spatula to flip to avoid spillage! Add rice and/or beans as a side to this dish to increase your carbohydrate intake to fuel practices and events! *Nutrition can vary based on the products chosen.